Engraved wedding cake serving set can be personalized with the couple�s names and wedding date, monogrammed wedding gift will become a family heirloom. A special occasion calls for special serving pieces. Description Knife 12" long Cake server 10 1/4" long White satin lined gift box included Whether you're using this dessert set at your wedding reception, anniversary celebration or simply to serve a luscious dessert, you'll find it's beautiful to look at and easy to use. 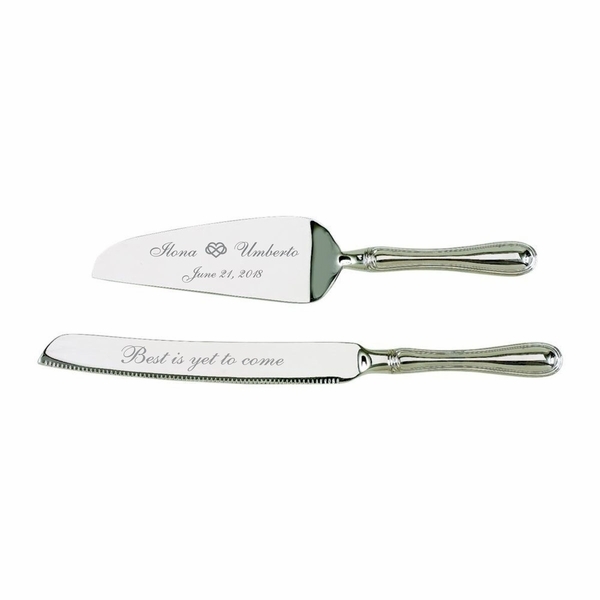 The set also makes a lovely engagement or wedding shower gift. Make this day special and memorable with a set truly special by having it personalized with your initials, names and/or wedding date.